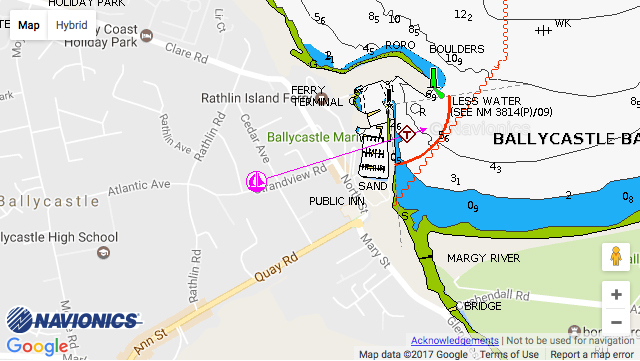 Ballycastle Marina: Ballycastle Marina is strategically situated just a few miles west of Fair Head and is a convenient arrival point from Scotland whether headed west or south. The marina is very sheltered, and just a few minutes walk from the town. The seaside town is famous for its Old Lammas Fair, which has been held at the end of August each year for over 400 years. Marconi conducted some of his earliest experiments in radio transmission between Rathlin and Ballycastle in 1898. The town is an excellent centre for exploring Fair Head to the east, and the Causeway Coast to the west. It has a good range of shops, pubs,restaurants, and bus connections.